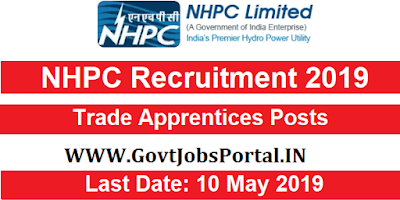 NHPC Jobs for ITI pass candidates for Trade apprentices posts. Fresh notification is out on the official website of NHPC Related to this employment notification. More information related to this NHPC Recruitment 2019 is given below in this job posting. Read it carefully to know more about the term and conditions related to these NHPC Jobs. Pay Band: Not mentioned in the Official PDF file. Various ITI Trades: “ Electrician, Welder, Fitter, Mechanic, Fireman and IT”. Those who have passed in 10th class plus completed ITI examination from the respective trade which we mentioned above from a well-recognized institution can apply. Application Fee: ZERO Application fee for Applying these ITI Jobs in India. Applications are invited from all Indian candidates without paying any application fee. 10TH May 2019 is the Last Date to Submit applications. To the Senior Manager (HR), Parbati-III , Power Station, Village Bihali, Post Office Marji, Distt-Kullu, Himachal Pradesh-175122 on or before 10.05.2019. Selection Procedure: The selection of the candidates will be based on merit list.